> What is the Best Format for Printing? > YottaPrint Wall Mural Software Released! WHAT IS THE BEST FORMAT FOR PRINTING? Many photo software editing programs give you certain options when saving JPEG (or JPG) images. You can choose the "quality" or "compression" amount of the image as you save it. But what does this really mean? The JPEG image format is a "lossy" image format. In other words, saving in the JPEG (JPG) format always attempts to take image information out of the image. Image quality and resolution are never improved using JPEG. Even saving using the highest level (least compression) will still drop information from the photo, though the lost information will be in the brightest or least visible areas the human eye cannot see anyway. Opening a JPEG and resaving a JPEG will accumulate loss in the photo. JPEG compression works by examining pixel brightness on a scale of -1024 to +1024. The compression (or optimization) works according to brightness - not by color. Compression is greater in brighter areas of the image (where changes are less visible) and less in darker areas. 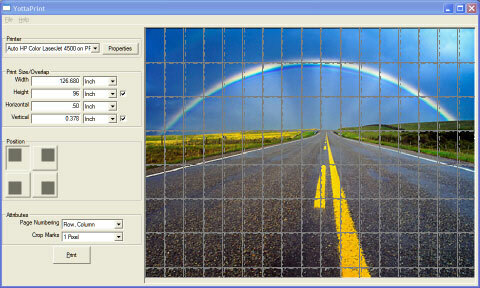 JPEG optimization uses a complicated mathematical formula that operates on 8x8 blocks of pixels. Why is this important? Many people think that JPEG images - because they often look very good on web pages or in photo directories are good enough quality for printing. Remember though that JPEG was developed for use on the web, where file size considerations are very important. Before the web, graphic artists had little use for GIF or JPEG images because they needed high quality images for printing on paper media - not for computer screen presentation. So, when choosing which format to save your images to, consider what you are going to use the image for - if it is for printing, GIF or JPEG formats should be avoided, and TIFF or possibly PCX should be considered as better (less lossy) alternatives. NEW WALL MURAL SOFTWARE RELEASED! Kneson Software is proud to release YottaPrint, a software product that extends the Imagener technology to one of its most practical applications - printing wall murals or posters from your own printer. YottaPrint allows you to print any image as big as you want and seemlessly assemble the image temporarily or permanently on wall surfaces. YottaPrint uses the Imagener Unlimited photo enlargement technology so that images have outstanding visual quality, even from home printers. The image to the right is 28 legal size pages (11x14") printed on a common HP 600 dpi black and white laserjet printer. The image is astonishing to look at - it has amazing quality. YottaPrint is the true manifestation of the power of the Imagener technology. Wall Murals - cover part of a wall, or an entire surface floor to ceiling. Poster Printing - favorite images can be printed and assembled in no time! Motivational Images - print large motivational posters. Signs and Safety Messages - for workplace and other applications. YottaPrint allows you to seemlessly put all the pieces together, because you specify how much overlap you want in the image, then YottaPrint prints crop marks so pieces go together quickly and easily. Pages are numbered in the margin by row and column. Print all pages at once, or single pages at a time. No other product allows you to do this with as much visual quality because no other product has Imagener technology incorporated right into the software. You won't believe the power of this product - it can change the feeling of an entire room and make small spaces seem huge! Kneson Software has built a directory of companies and products related to photo software. This directory contains the highest quality photo software available on the Internet. Click here to browse now.